The world's most famous chimpanzee (even more famous than Tarzan's sidekick "Chitah"), a long time resident of the Citrus Park area in northwest Hillsborough County, was featured on the NBC network morning program, The Today Show, from1953-57. 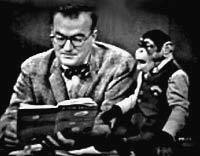 J. Fred Muggs was the first animal star (as a feature spot) on "live" television. 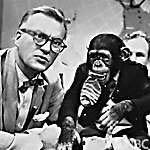 Beginning February 2, 1953, this chimpanzee in diapers shared the morning news spotlight with reporter/commentator Dave Garroway. 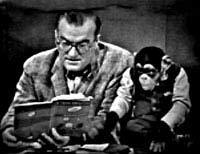 The simian was socko for the ratings, attracting the much needed advertisers to make the morning program a success. His talents included doing a mean Popeye impression and playing piano with Steve Allen. J. Fred Muggs was originally discovered by a staff member of THE TODAY SHOW while his owners, Buddy Mennella & Roy Waldron (former NBC Pages) were visiting a friend at NBC Studios in New York City. They had procured Mr. Muggs from the Henry Trefflich's Chimp Room in New York City for the cost of $600. At the time the chimp was 13 weeks old and weighed 3 and 1/2 pounds but eventually over the years weighed out at 175 pounds. The strategy behind using the chimp was to attract younger viewers who in turn would alert their parents (the real target of the advertisers) to the new celebrity. Also seen on the program was Phoebe B. Beebee, J. Fred Mugg's female chimpanzee companion. After biting comedian/actress Martha Raye on the elbow during an April 1954 program, Mr. Muggs was sent on a worldwide promotional tour. During his travels he attracted the attention of the Russian newspaper Izvestia which described J. Fred Muggs as "A symbol of the American way of life...Muggs is necessary in order that the average American should not look into reports on rising taxes, and decreasing pay, but rather laugh at the funny mug of a chimpanzee." His tour had bypassed England because the British government didn't want America's most likable chimp in their empire. Their sensibilities had been hurt when live shots of Fred's antics were seen during Queen Elizabeth's coronation in 1953. J. Fred Muggs returned to America and eventually was removed from The Today Show and replaced by a more docile, Kokomo, Jr. J. Fred Muggs later starred in his own short-lived show called The J. Fred Muggs Show, which aired out of New Jersey. In 1975 Mr. Muggs appeared on ABC's Good Morning America program for a 23rd birthday celebration. The chimp worked a show for five years at Busch Gardens in the late sixties and early seventies and settled in Tampa for retirement when the gig was over. Mennella and J. Fred Muggs were about as close as a man and an animal could get. Mugg's trainer died in Tampa in 2002 but J. Fred still lives comfortably with guardians in his Citrus Park home of more than 30 years and often sees famous friends such as Liza Minelli and Today Show personalities.